Energy efficiency is contagious. 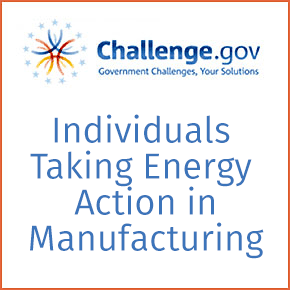 Share your best ideas and practices for generating measurable energy savings at U.S. manufacturing facilities. Making smart energy investments will enhance our nation’s security, productivity, and energy independence. For manufacturers, every dollar saved allows for investment in production, facilities, and jobs that ultimately makes U.S. companies more competitive and resilient. Improving the energy performance of manufacturing facilities has a broad impact; savings from reduced operating expenses can be reinvested in technology upgrades and new jobs. Through the ITEAM Prize competition, DOE is seeking the ideas and best practices from employees on the plant floor all around the country who not only recognize the importance of saving energy but are making it happen, strengthening their company’s competitiveness and driving cost savings in the process.